In Anders Breivik’s manifesto, the ostensibly Christian defeat of the Ottoman armies at Vienna in 1683 is the central historical event. He imagines a European rebirth in 2083, four hundred years later, and names the Polish king Jan Sobieski, whose troops were crucial to raising the Ottoman siege, as one of his heroes: “John III Sobieski and the Holy League successfully defended Europe against an army of more than 150,000 Muslims.” Breivik thinks Europe today is again under siege from Muslims, and that Europeans must resort to “atrocious, but necessary” violence to defend it. It is unsurprising that what Breivik has to say about European history is trivial. The plagiarism of his manifesto recalls Hannah Arendt’s point that those who do great evil may themselves be incapable of cultural creation. The superficiality of his worldview recalls her notion that the greatest of evils has no roots, and therefore has no bounds. But since the reference to Vienna has largely passed without criticism, it is worth recalling for a moment what actually happened in 1683. 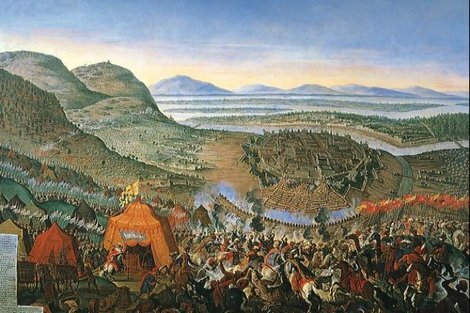 The lifting of the siege of Vienna was no simple victory for Christendom over Islam. It is quite true that Poland, at considerable risk to itself, marched its armies southward to rescue its Habsburg neighbors from the Ottomans. But old Poland was in no simple sense a Christian state. It had ignored papal objections to its treaties with Muslim and pagan states, and been the target of crusades from Germany. The Polish king was obliged by law to tolerate various forms of Christianity, including Protestantism and the eastern rite, as well as Judaism and Islam. The wealth of the land was largely due to the labor of Jewish managers; at the time more Jews lived in Poland than in any other country. Indeed, some Jews converted to Christianity and became Ukrainian Cossacks and Lithuanian noblemen—two groups that constituted parts of the Polish army that liberated Vienna. The Polish charge down the Kahlenberg to the besieged walls of Vienna on September 12, 1683 was indeed dramatic. A Turkish chronicler recalled “a flood of black pitch consuming everything it touched.” Who were these Polish cavalrymen, and why were they so fearsome? The Polish state had been in contact with Islam for all seven centuries of its existence. Wars with the Ottomans and their Tatar vassals in Ukraine were commonplace. It was in the setting of Polish and Ottoman battles for Ukraine that Hasidism took shape and gained popularity among Polish Jews. At various points Tatars also switched sides from the Ottomans to the Poles, sometimes having been taken prisoner first, sometimes not. In the Polish-Lithuanian Commonwealth, Tatars printed their holy books (kitab) in a Polish-Belarusian language, using Arabic script. Tatars fought in Polish armies in the defining battles of the age, for example helping to defeat the crusading Teutonic Knights at Grünwald in 1410. They came to form an elite part of the officer class. Muslims were thus among the Polish horsemen who drove the Ottomans from the gates of Vienna. The Muslim influence upon the rescuers of Christendom went far deeper than this. The very tactics of the Polish cavalry, regarded at the time as the best in Europe, were developed in contact with, and indeed copied from, the Tatars. Polish nobles bore curved swords. The shaved their skulls and grew their mustaches long. Just before the fateful charge down the Kahlenberg, each Polish soldier took a piece of straw, and placed it in his helm. This was an agreed-upon signal, allowing the Austrians to tell the difference between the allied Polish soldiers and the common Ottoman enemy. Like the Polish-Lithuanian Commonwealth, the Ottoman Empire was anything but a monoreligious state. Both states were based upon a political logic that is no longer possible to follow. Monarchs made durable arrangements with leaders of the various religions practiced in their realms: the Ottoman sultan left Christian matters largely in the hands of the Orthodox Church, whose patriarchs were more powerful under the Ottomans than they had been under Byzantium. Greeks were the traders and the financiers of the Ottoman Empire, and the Ottoman armies, like the Polish ones, were multiconfessional. Although we might think of the Ottoman Empire as Asian in origin, in fact its history begins with Balkan conquests, and most of its Balkan subjects never converted to Islam. These kinds of early modern arrangements, where a weak central state in effect confers authority to local elites in exchange for the ability to tax and wage war, are often regarded as models of toleration. It is quite wrong, it should go without saying, to imagine some sort of premodern Christian purity in Europe. Yet we must also be wary of seeing these early modern states as a positive model to which we could return. The creation of the modern state in the nineteenth and twentieth centuries, as Max Weber and Ernst Gellner quite rightly saw, involved the attempt by leaders of states to circumvent or abolish religious and other intermediaries, so that the relation between the state and the individual could be direct, and so that taxes and soldiers could be raised without compromises with local authorities. States that could not solve this problem, such as Poland and the Ottoman Empire, did not survive. Even if we wished to revive this tradition, no modern Western state could accept early modern levels of dependence on local elites, and few if any religious communities in the West are cohesive and obedient enough to endure rule by their elders. The tradition of cooperation with local religious communities continues, of course, but in Europe it is subordinate to the relationship between citizen and state. The problem for modern states is to reconcile state power and social diversity. One twentieth-century solution, exemplified by Nazi Germany, was to attempt to build state power by eliminating the diversity. This involved racist mass murder, and it also brought failure; failure that Breivik’s mass murder recalls both in its barbarity and in its self-destructiveness. Most European states are little concerned today with raising armies, but they are concerned with levying taxes to fund pensions. The functioning of the European welfare state depends upon the labor and indeed the civic good will of immigrants—which in Europe often means Muslim immigrants. These religious minorities cannot be ruled in the early modern way, and they will not, whatever Breivik and those like him imagine, be eliminated in the twentieth-century way. To preserve functioning states adaptable to unpredictable cultural novelty is one of the great challenges of our century. Norway, like much of Europe today, has witnessed the rise of a populist right, one that threatens to supplant the conservative traditions of Christian democracy. Although these various European parties are quite different one from the other, they are alike in denying the basic reality that Europe’s tomorrow depends upon how immigrants and their children experience Europe today. The laudably calm, lucid, and liberal reaction of the Norwegian government and the Norwegian people to Breivik’s horrible act suggests that this is perhaps more than a dream. They represent a Europe where, just possibly, a very functional state might make European identities appealing to those not born to them. via Toleration and the Future of Europe by Timothy Snyder | NYRblog | The New York Review of Books. It is tempting to think that it would have been better for Poland had the Turks taken Vienna. If Sobieski could break the siege of Vienna in a battle where neither Pole or Turk were defending, he could fight a defensive war in Poland against the Ottomans. Eighty-three years later, Austria helped itself to a piece of the First Partition.